This CD release collects the first two of three albums by this German band led by brothers Winfried (keyboards) and Norbert (guitar) Langhorst. 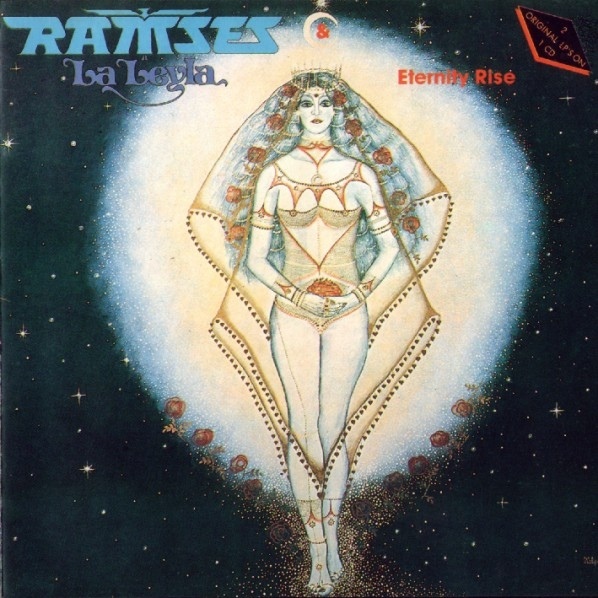 The band's music is in the spacy symphonic mould, comparable perhaps to Eloy or other mid-to-late-70s German bands, but these albums are better than most of the Eloy that I've heard — and I've heard lots of Eloy — I think because Ramses is a bit more original and has more sonic variety. The band's debut, La Leyla, was co-produced by "sound-wizard" Conny Plank and Jane guitarist Klaus Hess. With this release, they have already proven themselves more sophisticated than Jane. Winfried's keyboards act as the sort of musical significator, shimmering analog synth leads placed atop whirling Hammond organ and rich Mellotron/Stringensemble pillows. Drummer Reinhard Schroeter nimbly adapts to the shifting tempos, while Norbert's guitar emanates from the sonic keyboard sea with wailing solos. Herbert Natho is the vocalist, his range is mostly low- to mid-range tenor, but his voice can occasionally get surprisingly high. You may like him or you may not; he's never especially annoying, though, and I can't think of anyone to compare him to. He simply doesn't sound like anyone else but himself. On occasion (as on "Someone Like Me" or the title song from La Leyla), he is joined by Winfried singing harmony, who possesses a ghostly, quasi-female falsetto. This adds to the dark, minor-chorded tone of the album. Eternity Rise begins unremarkably with the string-laden ballad "City Life." But soon we're treated to more rhythmically/melodically refined fare as "Only Yesterday" and the instrumental "Agitation Play," which are easily as good as anything from the first album. In fact, the eleven-minute title song may well be the band's finest of all, the motival organ-led finale is truly breathtaking. In all, this is a highly worthwhile purchase for those who enjoy Novalis, Grobschnitt, Eloy et al. Ramses are easily on a par with their peers and helped pave the way for bands like Epidaurus and Anyone's Daughter. They didn't deserve to be as overlooked as they were.